ZQuiet vs SnoreRX - Comparing The Mouthpiece Champs! If you’re in the market for a MAD (Mandibular Advancement Device), the ZQuiet and SnoreRX are basically the category (and performance) leaders. I’ve tried them all, and I can say that chronic snorers that choose either are going to be satisfied with the results. Both devices are great on their own but they have striking differences that set each other apart that will help you decide which one is personally better for you. The ZQuiet is known for its one-piece “hinged design”. It is made of a blue transparent thermoplastic elastomer material that is BPA-free, which makes the ZQuiet durable yet pretty friendly to your gums. It has a unique design with a springy hinge that connects the upper and lower tray, which allows the jaw to move freely while the device is in place. This free movement is a key and unique part about the ZQuiet, and a definitely high end feature. The ZQuiet’s design incorporates a short pair of airflow posts on both the upper and lower trays that leave a space at the front of the mouthpiece allowing for free air movement even if you do not open your mouth. This particular design is really helpful for individuals who breathe through the mouth when sleeping. Meanwhile, the material that comprises SnoreRX is of a soft medical grade thermoplastic containing a hard plastic frame in the middle. The upper and lower trays utilize a two-piece design so it can slide into each other. The upper tray slides back and forth to its desired position while the lower tray stays in place. The SnoreRX does not utilize a hinged design like the ZQuiet, meaning you can’t drink or eat or talk while it’s in. As to who needs to do so, well, I’m not entirely sure. Suffice to say, the “freedom of movement”-for your jaw is lacking when compared with the ZQuiet. The SnoreRX also has its similarities to the ZQuiet. A prime example here is a large breathing hole at the front of the SnoreRx. Similar function, slightly different design. One of the best features of SnoreRx over ZQuiet is that you can adjust it to the exact setting you need to stop your snoring. You can adjust the settings of the SnoreRX by increments of 1 millimeter to a maximum of 10 millimeters or roughly ½” just by pushing its sides and sliding the lower tray to the front. This is a crucial aspect of tackling your sleep apnea based snoring. No matter the brand, no mouthpiece can really help you stop snoring if it does not hold your lower jaw forward in its ideal position. 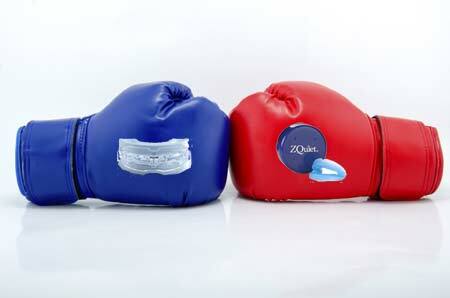 To overcome the problem of not having an adjustable jaw setting for the device, ZQuiet offers their customers two different sized mouthguards, both of which have a somewhat different advancement setting. Along with the device comes an instruction that tells customers to try the one with the smallest amount of advancement first. If you still snore while using it, you can move on to using the second device that ZQuiet provides because it will hold the lower jaw even further up front. You can’t “customize” like the SnoreRX, but the two different sizes will help you get close. You can increase your chances of finding the perfect ZQuiet to stop your snoring by choosing between the two sizes – “size A” and “size B”. Before using it, you must first boil hot water and then dip the SnoreRx in it for 60 seconds before placing in your mouth for 30 seconds. This ensure there is a “glove-fit”-type of sizing that fits the impression of your teeth perfectly. Meanwhile, the ZQuiet is ready to go straight out of the box. You no longer need to customize it like with most MAD mouthpieces. However, you can customize it a bit by trimming it around the edges with scissors. An important note about the SnoreRX vs. the ZQuiet is that the SnoreRX does feel pretty bulky in your mouth in comparison to the ZQuiet. Hey… Let’s be honest… One man’s comfort is another man’s torture. But, I do think both of these mouthpieces are wearable and comfortable to use. Given the choice, however, the ZQuiet’s ability to move and more streamlined design definitely beats out the SnoreRX for me. Both the ZQuiet and SnoreRx have FDA clearance. You can’t really call it a free trial for the ZQuiet simply because the cost is $9.95 for its 30-day trial. This price covers shipping and handling of the device. You will be billed for the mouthpiece’s full retail price on your credit card once the 30-day trial expires. However, if you send back the ZQuiet within the 30-day trial period, you will no longer be billed for the full price of the device but you won’t be refunded the $9.95 you initially paid for shipping and handling. Sadly, you’ll also shoulder the shipping costs in sending the device back to the manufacturer. Not a big deal for most, but definitely something to think about. The SnoreRX, meanwhile, is all about satisfaction guaranteed. According to their policy, you can ship them back the mouthpiece and get a full refund within 30 days of purchasing the device. The company also emphasizes in the policy that the customer will pay for shipping and handling if they decide to send the product back. For the ZQuiet, you have to pay $9.95 for its shipping and handling during the 30-day trial and an additional $79.95 once you decide to purchase it 30 days later. On the other hand, you pay $99.00 for the SnoreRx and an extra $2.28 to cover the medical device excise tax alongside the $10.00 shipping fee. All in all, it totals to roughly $118.28. Hence, you can actually save about 30 bucks if you buy ZQuiet rather than the SnoreRx. After a side-by-side comparison of the SnoreRX and ZQuiet, I discovered the things they have in common and the key reasons they are different. 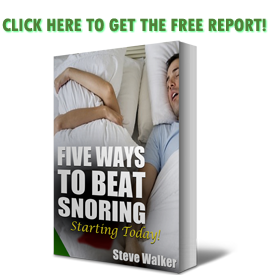 Both are very effective at stopping snoring, so either is a good by for the snorer that is looking for help. From where I stand, pricing and comfort favor the ZQuiet in a head-to-head matchup with the SnoreRX. I found the “mouth feel” of the ZQuiet was just better, and I didn’t as much like the immovability of SnoreRX. Thank you for this excellent and honest comparison. I have been trying out the ZQuiet and the smallest mouthpiece has successfully stopped my snoring….but I was wondering if other products like SnoreRX would be a better fit or choice. It appears I made the initial best choice as I have experienced similar results to you. Thanks!